The itchiness and flaking from a dry scalp can be irritating, to say the least. There are many different reasons that your scalp may become dry, and one of them is from using a hot hair dryer after you’ve washed your hair. The artificial heat from the hair dryer removes moisture. Even if you use a good conditioner, it will only help the hair. On a higher setting, of course, the hair drying process that is performed several times a week will take away even more of the scalp’s natural moisture. If you wash your hair with chemical-based shampoo, bleach or color the hair, use curling tongs or a hot iron, etc. every day, it’s all going to take its toll on the health of your scalp. If you have a medical condition, such as scalp psoriasis, your body is inevitably going to tell you that something’s wrong. In this article, we will explain why hair dryers cause the scalp to become overly dry. We will also provide some tips on how to keep the scalp and hair healthy. 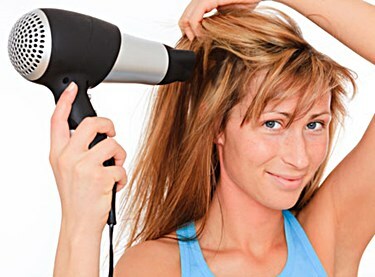 Using a hair dryer the right way needn’t result in a dry and flaky scalp. Let’s look at things a bit more closely. Why Do We Get Dry Scalp from Blow Drying the Hair? Can Dry Scalp from Using a Hair Dryer Cause Hair Loss? How Can You Protect the Scalp from Damage? Many of us are in a hurry to take a shower and head to work at the start of the day. This is fine, but not if you use a hair dryer on high heat. Pro Tip: The best way to blow dry your hair is to use it on the lowest setting, and hold it about 6 inches from your head. This is the only way the heat from the dryer won’t hurt your scalp. Yes, it will take longer, depending on how long or thick your hair is, but if your scalp is already dry, it won’t make the problem any worse. When you use hot air close to your scalp, you will not only drain the moisture from the skin, but you are causing the pores to become blocked. If you use hair products, these will settle on your skin, blocking the pores. This makes the scalp even drier, as the sebum (the natural oils the skin produces to keep it healthy), cannot do its job. Just because you use a hair conditioner with your shampoo doesn’t mean that it will make a difference. Hair conditioners are made specifically for the hair. The roots and shafts of the hair, especially. You need to use something that will rehydrate and protect your scalp, not just your hair. A dry scalp, for any reason, it can lead to hair loss. If you don’t get the proper nourishment to the scalp, the roots of the hair will be deprived of essential vitamins and nutrients. The supply of oxygenated blood will have been restricted. This also happens when people stop smoking, or shortly after they’ve given up smoking tobacco. The drier your scalp gets, the more damaged your hair will become. And yes, it can lead to breakage and hair loss in some cases. But there is no need for you to let dry scalp get this bad if you take action right away. No shampoo should be used every day if you’re prone to dry scalp. Wash your hair on alternative days, and you’ll instantly be reducing the frequency that you need to blow dry your hair by 50%. Use a natural and organic product to wash your hair, such as Christina Moss Shampoo. This will help to heal the scalp and hair. If you’re using shampoos that contain artificial ingredients because they’re cheap or you found the advertising enticing, this switch will help greatly. Cut down on the use of harsh styling products and hair coloring. If your scalp responds negatively to a product, use an alternative. It may be that you’ve developed an allergic reaction to one or more of the ingredients. Reduce the setting and hold the hair dryer further away from your head. Let the cool air dry off your hair. Applying “Ooh!” will provide your scalp with a source of quick relief from the itchiness. The cooling sensation will be welcome, and the natural ingredients will help your hair and scalp to recover from damage caused by blow drying your hair on a high setting. Use apple cider vinegar can help to heal dry scalp. It contains acetic acid and has a pH level that is almost identical to that of the scalp. Just mix it with some water and massage it gently into your scalp. Allow it to sink in for about 10 minutes and wash it out with a shampoo. Find out how to use a hair mask for dry scalp. It’s easy to apply, and it can be therapeutic when you want to remove the dryness. While you can get a dry scalp from blow drying your hair, there are ways to heal it. Keep drying your hair on the lowest setting until you can get rid of the dryness, though. As long as you keep your scalp healthy and hydrated, you should have no more problems.